The Cheapside hoard. 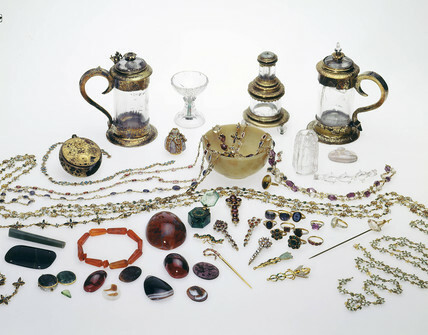 This hoard was originally part of a Jacobean goldsmith's stock-in-trade. The hoard was found in 1912 under a cellar floor in Cheapside. The collection is typical of Elizabethan jewellery, with many bright stones in simple enamelled settings, toadstones which were believed to have medicinal properties, and partially cut gemstones and cameos. The crystal tankard and salt-cellar were almost certainly pawns or pledges, while the large Columbian emerald has been hollowed out to take a watch movement.